I will post more thoughts later. Mercy Ann David was born on 1–23–15 at 3:23 pm. Her birth weight was #4 13 oz. She is 18–1/2" long. The delivery was physically the hardest pain Karie has ever had to endure. Mercy was born rump first. She was folded up until her feet popped out. After that followed the head. Karie was screaming out in agony because of the pain. Moments before the delivery, Mercy had been moving. On our side of the womb, she never drew a breath, nor had one second of a heartbeat. 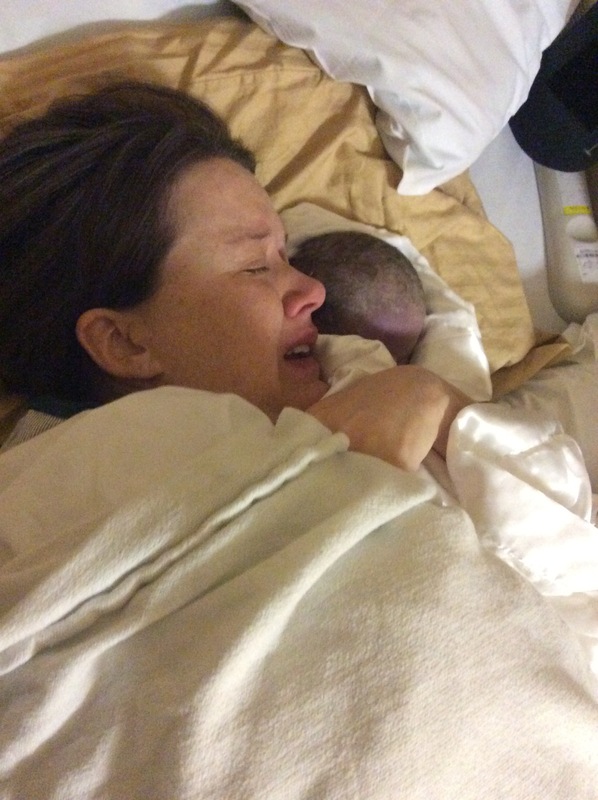 The doctor and nurse had her quickly wrapped in a blanket and placed upon Karie’s chest. We unfolded the blanket part by part to see her beautiful body. She truly is created in the image of God! She is beautiful with all her extra toes and fingers. I gave Mercy a bath and then my four other children and Karie’s mom came by. It was such a sweet time of bonding where each child had time to say hello, and then good-bye to their sister. Karie’s mom held Mercy and just wept. She had prayed that she would get to hold baby Mercy. I can not describe the pain, crying, and groaning that took place while Mercy was upon her Mom’s chest. This has truly been the hardest thing we have ever faced. I know more pain will follow; but at least we can begin the process of grieving the loss of Mercy and not anticipating her death. Thank you each so much for your support and prayers. I will have more reflections to follow. For the time being, Karie is just enjoying laying next to her sweet, sweet Mercy. Thank you Abigail. We were cared for so well through your father. Thank you also for the email you sent to Karie. Your words about being free to be weak were so fitting and sweet. Hi David Family – I met you all at Kost and saw Karie a couple of months ago at the Azure delivery. I’ve been praying for you all the past few months since I heard. Having had a stillborn daughter myself, I know the pain and grief you are feeling. I praise Him for your sweet Mercy! She has a purpose and while she rests in the arms of Christ, her purpose continues. On our daughter’s memorial program, we had this written, and I think it speaks the same for your sweet Mercy and I write in with her in mind: “Mercy was made not for this world alone, or even for this world mainly. She, like all people, was created in God’s image to glorify our Father in Heaven. She was conceived with an eternal destiny that God established from the foundation of the world. It doesn’t matter that her soul went to be with Jesus prior to her birth; her significance is not diminished. Mercy – who has been swallowed up by life – is fulfilling her eternal purpose in Heaven. She is all that God created her to be – perfect, complete, unique – glorifying God in a role only she can fill. What a joy it will be to meet (y)our glorified daughter in the presence of Jesus after we leave this earthly life” (based on the writing of Laura Johnson) May God give you peace and grant you His mercy as you walk this road of grief together as a couple and as a family. He is near to the brokenhearted and will bind up your wounds! These emotional wounds will weep for a long time, but the changes in your hearts because of your sweet Mercy, will draw you closer to Christ! Crying with you! Thank you Rachel. Karie remembers you very well. Your words are so kind and fitting. Thank you for grieving with us as you most surely are taken back to your own loss. Blessings. I am grieving and weeping with you. No words. Praying, crying, and praying some more. Thank you friend. Your words are sweet and touching. Prayers for you, Scott and Karie, and your beautiful family. We are so sorry for your loss and suffering. Prayers also for Mercy who isn’t with you but with her Father in heaven. I’ve been praying for the comfort of the Lord to rest heavy on you like a quilt. We also have a son (Jackson) in heaven and rejoice with you that our children are with their perfect heavenly father. But, our hearts also are completely broken for you here left on earth. Praying sufficient grace for your entire family. Oh thank you Berne. The passage you quoted blesses us deeply. We are sorry for the loss of Jackson. There is such hope in Jesus. Scott. I had only just recently heard about what you and your family have been dealing with these past few months. It certainly has been a testimony of your relationship with Christ, and His compassion, comfort and love for you guys during this time of grieving and God’s grace. I have been praying for you with a unique knowledge and understanding of what you are going through. Your story, the way your family has so preciously walked through it and the way you have so humbly shared it with us, is in so many ways a reminder of God’s grace when we went through almost identical struggles, grief and dependence on God and his grace for strength to get through each day, and His love for when we are too weak to do it on our own. Our son, Christopher, has been with the Lord for almost 25 years now. Watching and hearing about how your family has surrounded Mercy with such love, and so lovingly greeted her and tenderly said goodbye in that same moment, and the gentleness in which you treated her after she entered this world, is truly testament to your family’s godly character. But what makes the biggest impact on me is the worth you placed on her through this struggle. To show that there is no less value in Mercy than there is in any one of your other children, truly shows a loving and Christ-like heart. As much as God is carrying you through this, He is using you and your example to glorify Himself and drawing others to Him. At times of such intense and deep grieving, I am praying that God shows you glimpses of His compassionate purpose, not only for your family, but in the lives of others around you, so that you can take comfort in His loving grace. I know your faith is already deeper and stronger, even though you may not see it now, and that it will be deeper still as God carries you and heals you in the next weeks, months and years. Your hearts will always be tender toward Mercy and God’s grace, even decades from now, for that is a gift from God. Please know that through your story, there are already seeds of faith growing in you and your family, and the lives of the people God has watching and praying for you guys. May the blessing of God’s grace be on you through this, now and in the years to come, until you see Jesus face to face. I can not seem to find the words to express my thanks to God for your words. He is beginning to answer our prayers as to how he might glorify himself through this trial. Thank you. I am sorry for the loss of Christopher. Your loss has enabled you to bring comfort to us. May we see one another some day in heaven. Oh thank you so much Gil. We are resting safely as is our dear Mercy. GRBC prayed for you both morning and evening today. May God greatly comfort your hearts and guard your hearts and minds! Thank you Pastor Sam. God has been greatly comforting our hearts and guarding our minds. Thank you so much for praying.